The Language Services Agencies: Are they good for you? I wanted to write about language service providers for some time, but it wasn’t until this morning when a colleague shared his story with me that I finally decided to sit down and do it. An interpreter was hired by an agency to provide his professional services for a 2-hour administrative court hearing. Phone calls and e-mails were exchanged, a fee was agreed upon, and the interpreter received the necessary materials and information from the agency representative; there was even an automated confirmation telephone call three days prior to the event. Everything looked normal. On the afternoon before the scheduled event, the interpreter received an automated e-mail informing him that the hearing had been cancelled. Because the notice was received less than 24 hours before the scheduled start of the assignment, this interpreter prepared and sent an invoice to the agency for his 2-hour fee. Of course, he had been offered another assignment that he turned down, because he was already booked, just the day before he received the cancellation notice. Sounds familiar right? I think there may be an unwritten “universal law” that says that every time an interpreter gets a job he will get one or more offers for the same day afterwards. I know you all know what I am talking about. Let’s get back to our story. Of course, my colleague was not thrilled since he was only going to make the equivalent to a two-hour job and he couldn’t get any other assignment for that day, but that is the “price” of doing business. This is the risk we all take when we chose the freedom of working as a freelancer. To his surprise, and mine when I heard the story, the agency representative contacted him right away to let him know that he was not going to be paid anything because the assignment had not taken place. The “less than 24 hour notice” of cancellation didn’t mean anything to them. Of course he will fight this battle and already started the process by going to a collections agency, but it made me remember another event that happened to me some months ago. After I recovered from an anger attack, I wrote her back, copying her boss, explaining her how we work and how we bill, and eventually I got an apology letter and a check for the right amount. There had been no mistake in this case. She turned out to be a new employee and It was all due to her ignorance of the profession. (1) First: Not all agencies are created equal. There are agencies that you want to work for because they are good and professional. They are usually the ones with the best clients, the more relevant events. I am referring to the premier conference interpreting agencies that operate nationwide and worldwide. They offer the whole package to their client: the best equipment, the most comfortable booths, all-star technicians, and the best interpreters. They work with you, pay on time, pay well, and treat you like a professional. (2) A different type of agency, also big (sometimes huge) and universal, is the one that provides telephonic services or in-person services at administrative federal courts. They have a lot of work; some of them trade in the stock market, and offer an average to below-average interpretation service to their client. They are popular and well liked by their clients because they provide the service at a moderate price, can offer the volume and variety of languages that nobody else can. They usually have administrative support staff that deals with the interpreters, pay very little, and don’t pay as quickly as the industry’s average. Their interpreters tend to be of a less-than average professional quality, very new to the profession, and in some cases they even work from outside the United States. (3) Then you have the mid-size agencies who work regional or local markets. These agencies handle many events, some of them are conferences, others are not but they still call them conferences. These agencies also provide other services at the regional level such as medical interpreting, out-of-court legal interpreting, and in some markets even in-court interpreting services. These agencies aren’t big corporations; they are often a small firm or even a family business. This is the group where you must be very careful because there are some excellent agencies that provide the same or almost the same services that the big ones offer, including equipment and the highest quality interpreters (because for many reasons, the good ones are not always busy working with the big corporate agencies) but you also have many mediocre agencies that are this size. The problem is that they offer poor equipment, no equipment, low-level technicians, no technicians, and, for the most part, interpreters that don’t belong in the “A” list. They are usually staffed by poorly- paid employees with little experience, deal with clients that some times are not reliable, pay very low interpreter fees, don’t always pay on time, tend to ignore invoices for minimum guaranteed interpreter time or cancellation fees, and sometimes just don’t pay the interpreter. They often work with interpreters with no academic or professional training, and are very defensive when asked about their practices. (4) Finally we have the small interpretation services provider. These are agencies that operate at the local level; many of them owned by an individual who sometimes is an interpreter, translator, or a relative of one of them. Many of them do business from their living rooms, have a mailing address at the UPS Store, and “train” their own interpreters because they cannot afford higher quality professionals due to the pay they offer or the type of assignments they hire their interpreters for. Sometimes they offer equipment, usually portable, work “desk-top” community events they refer to as “conferences,” contract with local medical facilities and administrative law attorneys, pay less than anybody else (with the exception of some of the telephonic agencies above) and treat their interpreters like journeymen instead of professionals. Try to work for the first group I mentioned. There will be times when a mistake will occur, like in my story above, but they are few and can be promptly fixed. Sometimes you may need to better yourself to get to those jobs; if that is the case, go do it! This comparative essay should be your motivation to do it. You should also work for the first ones I mentioned under number 3. They are often as good as group one, only smaller. The main problem you will encounter in this group is that they will have less events and therefore you will have more competition among the top-quality interpreters who will try to get these assignments. Stay away from the second group I mentioned under number 3. Do not let them sell you the “lemon car.” But…if for some reason you said “yes” to one of their assignments, put everything in writing, save all communications, and be ready to take them to the collections agency or before a judge if needed. I would stay away from the agencies mentioned in number 2. However, if you have to work for them, negotiate a better rate than the one they will offer, and I mean a BETTER rate, not another $20.00 per hour. In all likelihood they will not hire you, but if for some reason they ever do, you will not be hurting yourself or the profession by accepting peanuts for professional work. Avoid the ones in group 4 like the plague. Conditions in this group of agencies will never get better and on top of giving away your work in exchange for almost nothing, you will be hurting your reputation every time you work for one of them. Stop before your professional name is beyond repair. Remember, there are excellent agencies out there but you need to do your homework and you need to learn how to say no. One of the most popular comments of many interpreters is: “They are too big, I hate them but I have to do what they want, even if I know it is little money, even if I know they don’t treat me right. I need the money. I can’t quit.” My answer to this dilemma is clear: Don’t work for them. I don’t care how big and powerful they are. You have a way to change what they pay you: stop returning their calls and emails. The moment you do this they are out of your life. No more suffering. No more humiliation. They are gone. The best part: Now you will have no choice but to become a better interpreter or translator so you can be hired by better agencies, directly by your clients, or you will have the freedom to start your own business. Let your refusal to work for them be your motivation to improve. You will face hard times for a short period of time, but it will not take you long to start making a better income because you will discover that when you are used to work for peanuts and you decide to stop, any decent interpretation job will provide you a better income. The cure to the “bad agency syndrome” is very simple; it is like smoking: It is harmful, just quit! Big change to the way the federal court interpreter exam is rated in the U.S.
As I write this posting many of my friends, colleagues, and students are taking the toughest court interpreter exam in the United States: The federal court interpreter certification test. There are other court or legal exams given by government agencies at the federal and state level, and even the private sector has designed some interpreter exams, but no test is as demanding as the federal certification exam. This week, just like one summer week every two years since the test has been in place, hundreds of Spanish-English interpreters: veterans, newly graduated, newcomers to the United States, and many others who previously passed the written test (at least one year earlier) are culminating months on study, practice and psychological preparation as they leave their hometown and travel to some of the largest cities in the country to have their skills tested for some forty five minutes. During that period of time they will attempt to demonstrate that they are ready to interpret simultaneously, consecutively, and to sight-translate in the United States federal courts. Within the profession it is very well known that this is not an easy exam; in fact, the passing rate of the attorney bar exam is substantially higher than the federal court interpreter certification test. As someone who has gone through both exams I can even say that it is harder to get certified as an interpreter. Traditionally there have been two systems to rate the examinee’s rendition: For many years the test was administered orally before a live jury of three certified interpreters who would rate the applicant’s performance. Years later the system changed to a recorded test where the examinee would sit in a room with a proctor and record the rendition. Afterwards, the recording was reviewed by a team of three certified interpreters that would rate the performance based on the recorded material. This year, for the first time ever, the renditions will be rated not by a jury of three certified interpreters, but by teams of two. This change is as radical as the switch from a live oral test to a recorded one. Generally in life we encounter all kinds of panels, juries, and other deliberation groups that consist of an odd number of members, and there is a reason for that configuration: You eliminate the possibility of a tie, you discard the scenarios where an even number of people can agree to one thing and at the same time another even number of people agree to another making a majority decision very difficult. The odd number gives you unanimity or a tie breaker. In other words, it assures you that there will be a final decision. In the case of the federal court examination a final vote of 3-0 or 2-1. The new system will no doubt result in many unanimous decisions of pass or fail, but there will be ties, and when the two raters cannot reach a consensus the exam will be sent to another panel who will rate it and decide. The system seems fair, I am not so sure that it will be as quick and efficient as the 3-rater panel, but it seems like a reasonable solution to a tie. I know many of the raters and as far as I can tell, an overwhelming majority have rated exams in the past; many of these interpreter-raters have scored tests under the two previous systems and most of them have demonstrated to be fair and capable. I do not believe that this will make the exam easier or more difficult, I don’t know if this will make it more efficient, and I don’t know yet if this will make it as fair as it has always been in the past. Everything indicates that it will be fine, but to know for sure we have to wait and see. I will be carefully watching the outcome as I am interested to see not only if more people fail under this new system, but also if more people pass. Big changes one way or the other could be a symptom that something is not as it was before. I give them the benefit of the doubt and today I assume that everything will be fine; it is just that a jury of two looks a bit strange. Please share your thoughts on the test and this new rating system. How to pack for an out-of-town conference. Today I want to share with you my formula to work assignments all over the world while only carrying what I really need. There is nothing more annoying than having to cough up excessive weight fees at the airport counter or arriving sweaty and tired from dragging heavy luggage from terminal to terminal to hotel and back to your home. I know that many of you travel as much as I do and I am sure you have a system that works for you. My first rule is: When you already have a method that yields a light bag without being deprived of the basics, don’t change anything; but if you struggle every time you pack before a trip, or if you cannot figure out why your stuff doesn’t fit in the bag when you pack at the hotel, even if you were able to put it all in there at the beginning of the trip and you haven’t bought anything else, then this posting may be for you. Second rule: My system works perfectly for men, but women would have to make some adjustments as you have to pack items that we do not. While the little shampoo and conditioner bottles at the hotel bathroom may solve a man’s problem, many women will need to carry (or purchase at the point of destination) bigger bottles of shampoo and conditioner. Men can travel for a month with a pair of shoes; women cannot. But even if you have long hair and need to pack high heels and booths, these tips can help you with the rest of the items you throw in the suitcase and never even use during the trip. I have been traveling all my life, and when I say traveling, I mean it. Last year I was on the road for 320 days, and rarely stayed home in Chicago for more than a week at a time. This means that I have learned how to live with less without being deprived of life essentials. If you are going to be away for a week or less, you need a suitcase, ideally a garment bag so that your clothes are protected. 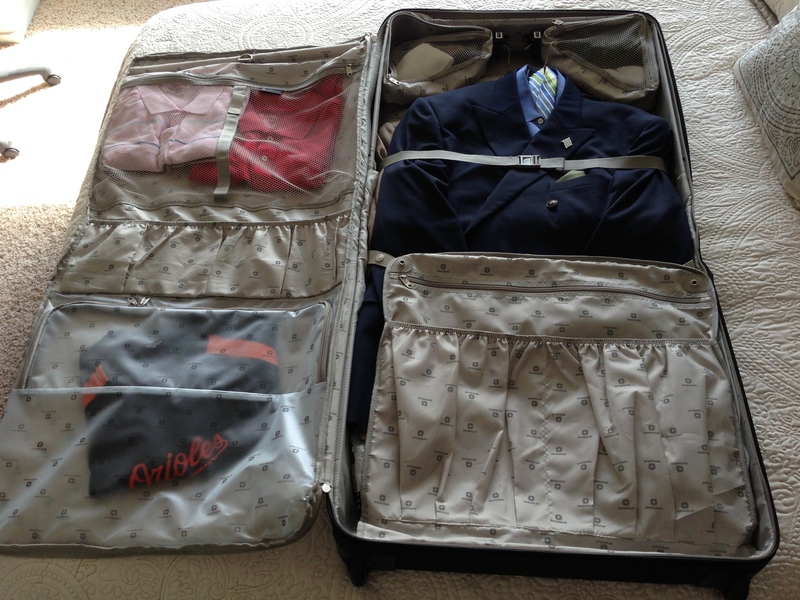 My favorite is the 46” Zurich wheeled garment bag from Swiss Gear. It is affordable and of good quality, plus you can get it at places like Office Max and Target. You can always bring a collapsible bag inside the garment bag in case you need more extra room on your way back. You will also need your favorite briefcase. This will be your carry-on and it is where you will keep your electronics. If the trip is longer, or if you need to take more shoes, shampoos, or other items, take a second suitcase. I prefer the 20” Swiss Gear Zurich upright spinner because I like to take it on the plane with me, but if you prefer the 24” one, that is fine, just document it together with the garment bag. I like these collection because it looks good, it is durable, and the price is right. I learned many years ago that there is no need to buy expensive luggage if it will last you, at the most, one year (Have you seen how they handle your bags at the airport?) I suggest you fly an airline where you have a frequent flyer plan. This way in most cases you can take two pieces of luggage in the plane’s underbelly at no extra charge. You will also board before most passengers, even when flying coach, so you will have plenty of overhead compartment room for your carry-on luggage. Get your electronic boarding pass sent to your iPhone, store it in Passbook (the application is free) go to the airport, document your bags, and relax at the airline club. Domestically I prefer Admiral’s Club over United, Delta and other smaller carriers, but we all have different tastes. The important thing is that you want to find a place where you can charge your gadgets and enjoy a drink before the trip. What to pack? Men need to pack three wrinkle-free blazers that match the season at the place of the event. Remember, you may live in the northern hemisphere where it is winter, but if your assignment is down south you will need summer clothes. Take three of the classics: navy blue, black, grey, dark brown, light brown, etcetera. Take 6 pants. Same rules apply. You will need 5 wrinkle-free pants and one set of jeans. Remember that you are wearing your sixth wrinkle-free pants during the flight. These items, plus six wrinkle-free long sleeve dress shirts in assorted colors will give you all the combinations you need for a month-long trip. I would also take 9 ties, a two-way belt (the kind you turn around to go from black to brown) and enough underwear for a week. Hotels have laundry and dry cleaning services that are often cheaper than the same services in a big urban area. My laundry and cleaners are always more affordable at a hotel in Virginia than at home in Chicago. After that, all you need are three polo shirts, one T-shirt, shorts for the gym, a baseball hat, and a pair of snickers. You are already wearing your dress shoes. Take comfortable good moccasin-style shoes. No shoelaces when going through security at the airport; for the ladies: No boots when dealing with TSA. Remember, you are already wearing the extra jacket or winter coat during the flight. It is essential to pack your toiletries in the garment bag as well. Less items to show at the airport security point. 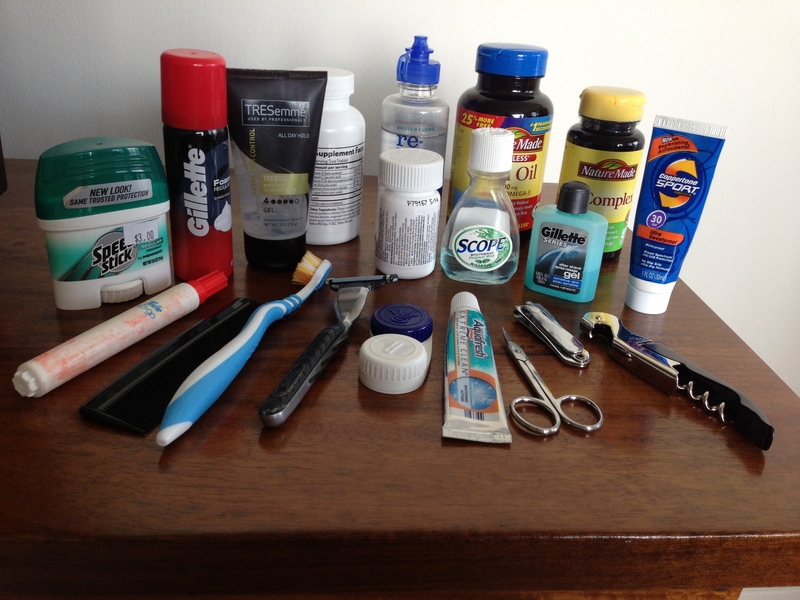 Always take travel size items like deodorants, shaving gels, hair products, after shaves, toothpaste, and others. Do not forget your toothbrush. Men: Don’t bother with shampoos, conditioners, mouthwash, or body lotion. Hotels provide them. They also furnish other toiletries when you request them at the front desk. My experience has taught me that you should also take a small pair of scissors, nail-clippers, a sewing kit, shoe-shine cloth, and yes: a corkscrew. The worst thing after a long day in the booth is a bottle of wine in the room and no corkscrew. Finally, a small collapsible umbrella and your vitamins and prescription medications need to go in the big bag. Save some for the carry-on if you will need them during the flight, plus an extra set in case of an emergency. The rest can travel with the checked in luggage. In your carry-on, ideally the same briefcase you will take to the event, take all your work tools: i-Phone, i-Pod, i-Pad, computer, all necessary chargers and cables, a portable electronic dictionary (in case there is no internet) your headphones (the best ones for music and the best ones for work) a few of your favorite pens, all your hotel, airline, car rental loyalty program cards, plenty of business cards, your passport (if traveling abroad) some cash and foreign currency if applicable, your official identification card, an ATM card, and a couple of good solid credit cards (from a travel plan so you get credit) That’s it. All other documents should be scanned and taken electronically, your reading materials, for work and for fun, should be on the i-Pad. Finally, lock your home when you leave and put your home keys away for the duration of the trip. Most briefcases have a place where you can hang clip them. Do this so that you can easily find them when you get back after a long trip. interpret an event away from home. Please share your comments and suggestions on this issue that is crucial to so many of our friends and colleagues. Last week I posted my first five worst things an interpreter can do to another interpreter. Next, I share the rest of my list in the understanding that there are plenty more examples of these “worst things,” and inviting you to review my top ten, tell us your “war stories” and share your comments and solutions with the rest of us. To be a bad interpreter. The individuals who have worked as “interpreters” for many years and even decades, don’t know anything about the profession, don’t care to know anything about it, and are revered by some as “interpreting gurus.” We all know who they are, where they are, and how they work. They represent a cancer to the profession because they go around providing a deplorable service, often charging good money, and damaging our collective image. Most of the time they work in a parallel universe and we rarely encounter them, but when we do, our job can be a disaster as we are faced with a situation where we have no partner to consult, no colleague to collaborate with, and no professional to back us up. A quick remedy when faced with this situation in the booth or the courthouse is to set the rules straight and ask this person to support by doing certain chores that you will assign. When possible, it would be best to postpone the event, even for a short while, in order to find a replacement for the bad interpreter. There is no solution to the bad interpreter problem described in this paragraph. It is terminal. To take advantage of your partner. The interpreters who do not pull their own weight during an assignment and interpret less than the time previously agreed to; do not return to the booth or courtroom on time for the switch, and those who do not help with the preparations: research, development of glossaries, or assignment of tasks. These are the people nobody wants to work with because there is never a feeling of team interpreting during the event. A quick on-the-run solution may be next to impossible, but you can at least talk to them before or during the assignment and voice what you expect them to do. As a long term strategy it is best to avoid them in the future, always declining a job offer by explaining the reasons why you would love to interpret the conference or trial, but with a different partner. To publicly correct and criticize other interpreters. Those know-it-all interpreters with very little social skills and less discretion who vociferously utter vocabulary and terminology from one end of the room to correct what they think was a bad rendition, and sometimes not happy with this, are happy to show even more disrespect to a colleague by loudly stating the reasons why they are right and you are wrong. It is very difficult to find anything more unprofessional than these actions. It is true that team interpreting exists so that colleagues can work as a team and cover each other’s back; it is also a fact that we all make mistakes and that sometimes we do not notice them. A benefit of having a partner in the booth or courtroom is that we can improve our rendition, and in court interpreting even correct the record, by stating our error or omission. However, decency and professionalism, together with a touch of common sense, tell us that there are better ways to correct a colleague or to offer an opinion that have nothing to do with screaming and yelling. A simple note, sometimes a stare is enough to get your partner’s attention. When faced with this situation the thing to do short-term is to stay quiet, keep your cool. Let it be forgotten by those who witnessed your partner’s crude behavior. Then, at the earliest possible time, always as a professional well-mannered individual, confront him; let him know that this is unacceptable, and that you expect this will never happen again. Do not let him get away with it. A long-term solution would be to avoid this “colleague” like the plague. To interpret in a way that hurts your partner’s rendition. First we have the colleague who is too loud. So loud that you cannot concentrate. I am talking the kind that makes the booth vibrate when he speaks; the one you can hear better than your booth partner even though he is interpreting two booths away, and second, we have the interpreter who is very slow during relay interpreting to the point that all the booths waiting for the relay start thinking about doing a direct interpretation even if the source language is not their strength. Short term you need the loud interpreter to concentrate in his volume and long term you need to help him or her find out the reason for this loud rendition. Many times people who speak loud cannot hear very well. Maybe the long-term solution will be a hearing aid or a special set of headphones. The solution in the relay interpreting case can only be to endure for the day or until adequate replacement can be found. In the future this interpreter should not be used for relay interpreting situations. There are many excellent interpreters who cannot adapt to the pace of relay interpreting. There is plenty of work that does not involve relay interpreting where a good interpreter is needed. On this Fourth of July all Americans celebrate our independence. We know that on this day we recognize the immense wisdom and unlimited courage of a group of men who lived in the same right place at the same right time. Although most of us will spend the better part of the day watching baseball, having a hot dog, and attending some local fireworks tonight, I thought that this year it would be interesting to once again talk about a little known aspect of the founding fathers’ lives: Their knowledge of foreign languages. You are currently viewing the archives for July, 2013 at The Professional Interpreter.